75 Feet 3-RCA Component Video Cable. Component video RCA interconnects. Provides high-definition video signal transfer between DVD players and high-end TVs or monitors for optimum picture resolution and color. Flat-ribbon cable configuration. High-retention RCA connectors Color-coded -fully molded construction. Ideal for connecting DVD and Blu-Ray players, satellite receivers, video game consoles, and cable boxes to HDTVs and video projectors. Allows connection of 3 RCA Component Video outputs to a VGA Component input on a Plasma, LCD, or Video projector display. Provides high-definition video signal transfer between DVD players and high-end TVs or monitors for optimum picture resolution and color. Unparalleled quality and performance for high-definition video and audio equipment. Fully support (Y; Pr; Pb); (Y; Cr; Cb) and RGB high resolution standards. Provides high-definition video signal transfer between HD TVs, DVD players or monitors for optimum picture resolution and color. Connects any DVD, TV/HDTV, VCR's, receivers and other home theater devices with component video connectors. 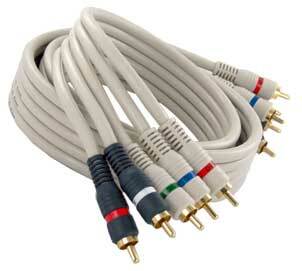 In this section you will find component video cables with RCA, BNC, with and without audio. These cables are used with older DVD Players, Cable/Satellite Boxes and Home theater systems. These cables are capable of up to 1080p resolution. Our component video cables come in various sizes and types. Find premium component audio video cables, Python HDTV cable, RCA component video cables and a whole lot more. You can buy component video cables as per your cabling requirements and budget. We believe in offering high quality cables at the lowest prices possible (upto 90% off retail price) We also provide lifetime technical assistance and extended warranty. All our products are RoHS compliant and environment friendly.